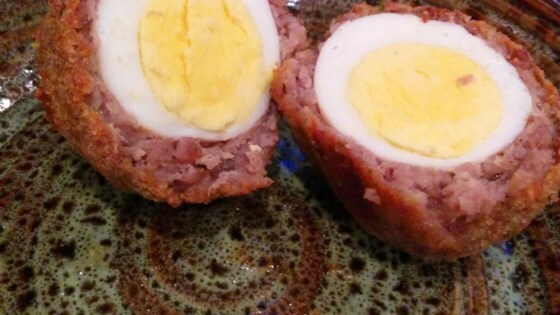 "A baked version of the popular pub Scotch egg. No need to fry here. Comes out just as good as the fried version without the mess of frying. Serve hot with mustard of choice." Preheat the oven to 450 degrees F (230 degrees C). Line a baking pan with aluminum foil. Place a wire rack over the foil. Cut and form pork sausage into 2-ounce patties. Place a hard-boiled egg in the center of each patty and press sausage around the egg. Beat raw egg in a small bowl. Place bread crumbs in another bowl. Dip each patty into the egg; roll in the bread crumbs to coat. Place coated patties on the wire rack. Bake in the preheated oven until golden brown, 20 to 22 minutes. Serve hot. How to make Scotch eggs!